As a parallel session on February 27, 2018, during Bio-Gene-Sys 2018 organized by Department of Biochemistry and Molecular Biology Pondicherry University. 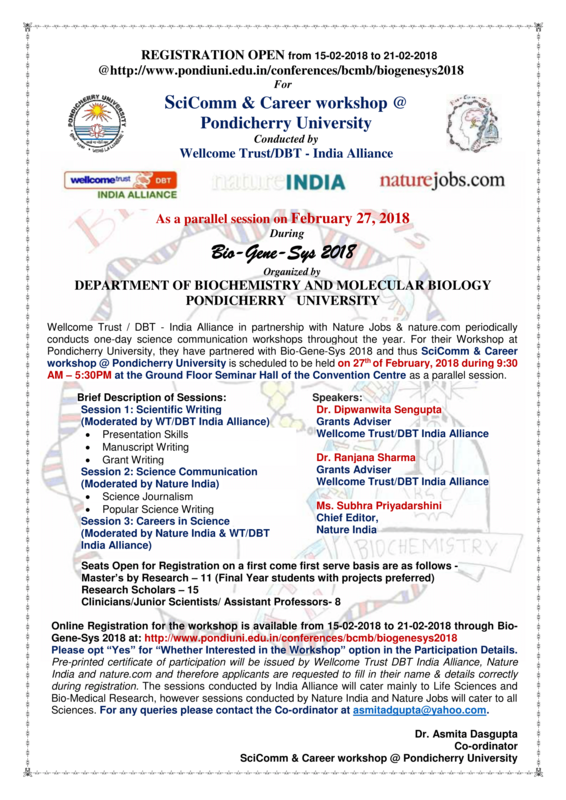 Wellcome Trust/ DBT - India Alliance in partnership with Nature Jobs & nature.com periodically conducts one-day science communication workshops throughout the year. For their Workshop at Pondicherry University, they have partnered with Bio-Gene-Sys 2018 and thus SciComm & Career workshop @ Pondicherry University is scheduled to be held on 27th of February, 2018 during 9:30 AM – 5:30PM at the Ground Floor Seminar Hall of the Convention Centre as a parallel session. Listed on 16 Feb 2018.